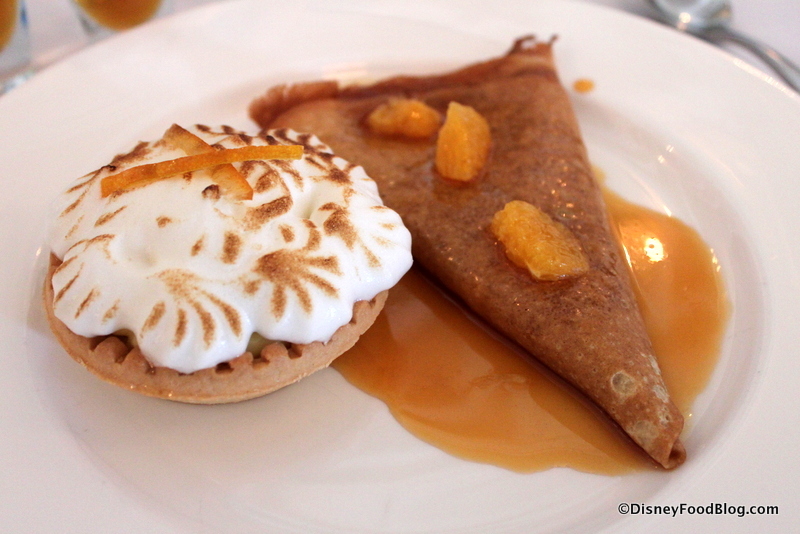 Today, we are heading back to the France Pavilion for another fun 2013 Epcot Food and Wine Festival review! One of the things that I love the most about the festival, year after year, is the inclusion of hot trends. Often, these reach far beyond just food and wine. In the last few years, mixology has continued to gain popularity as people look to perfect their cocktail-making skills. And we’ve really enjoyed seeing the trend play out at the festival with the introduction of mixology demonstrations and special events. 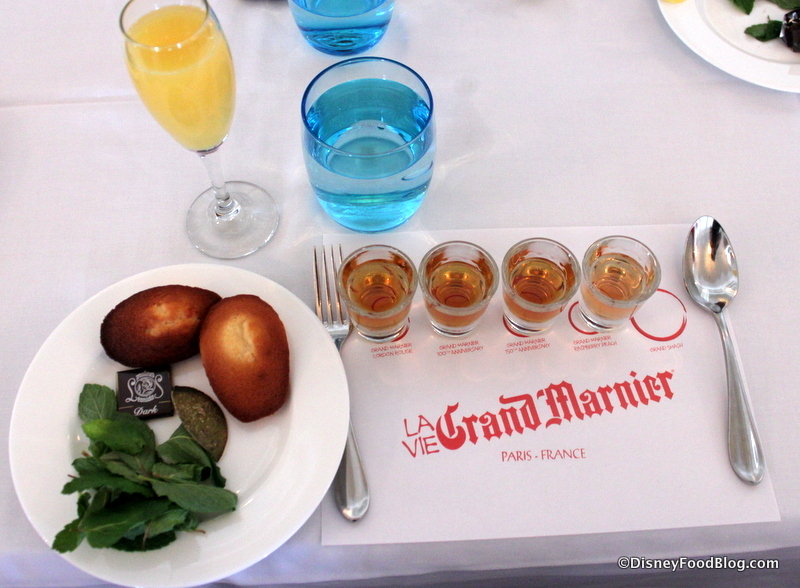 During my recent visit for opening week at the festival, I had the opportunity to attend the Grand Marnier Tasting. 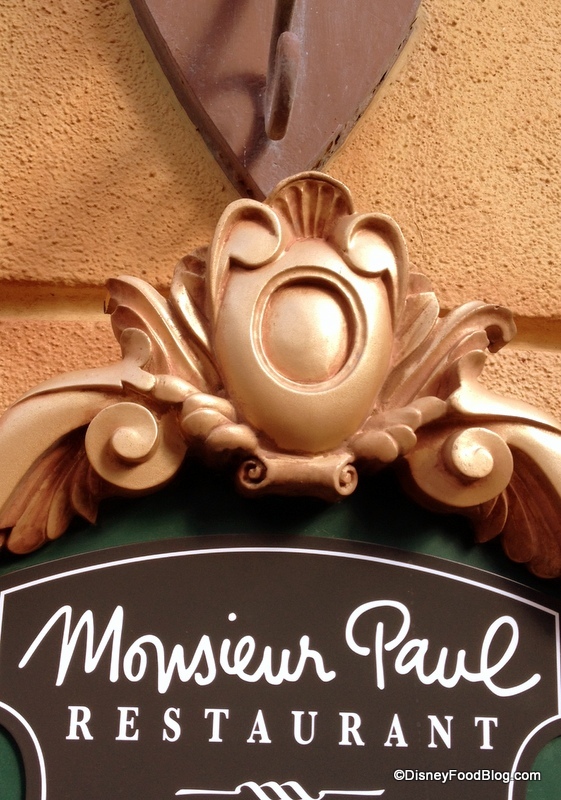 This special event — officially named Taste, Shake, and Indulge Like the French — takes place on Saturdays during the festival, from 2:30-4PM, at Monsieur Paul. Note that many folks have had Disney reservations agents tell them that the tastings are full, or non-existant, when actually there are still seats available. This may be due to guests asking for the Grand Marnier event instead of referring to its actual title — Taste, Shake, and Indulge. Definitely an understandable mishap, but just an FYI. 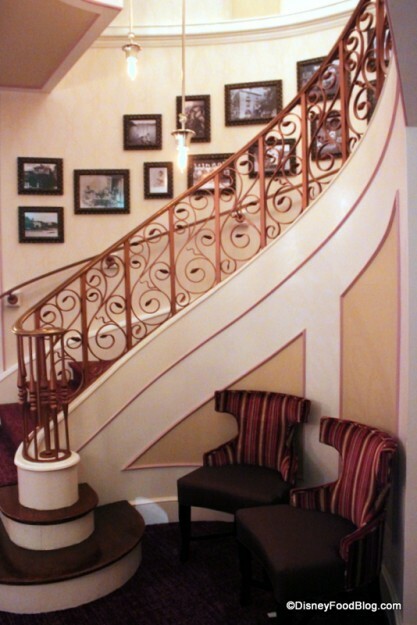 Once upstairs, you’ll notice a relaxed yet refined vibe that tells you you’re in an upscale restaurant — but your comfort and enjoyment are what is most important. 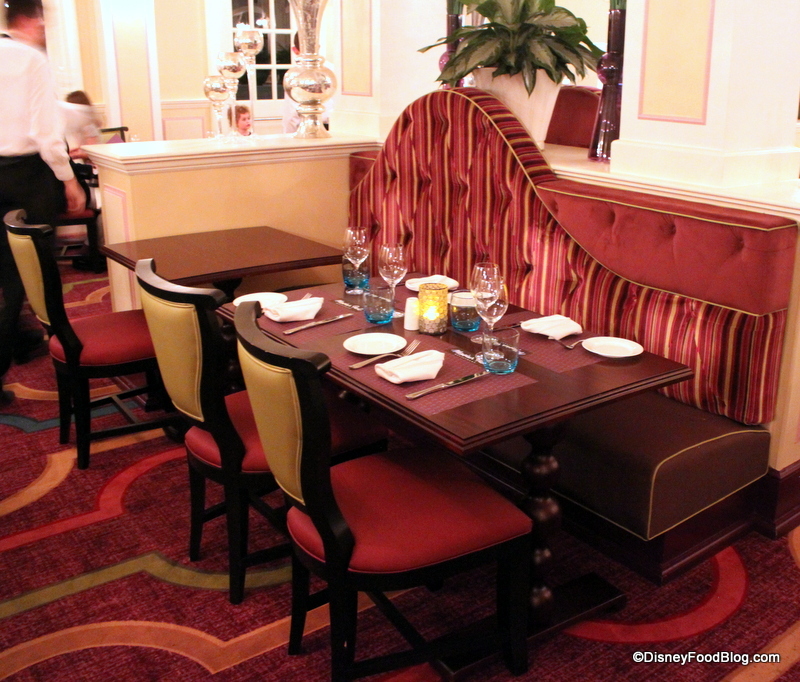 Banquettes and cushioned chairs are comfortable places to spend the afternoon. Seating is assigned, so you will most likely be making some new friends during the event! “Eats” is a bit of a misnomer here. We will be eating. But the star of this show is Grand Marnier in all its glory. When I arrived, I was greeted with a Mimosa — made slightly orange-y-er by the addition of Grand Marnier to the Orange Juice and Champagne. 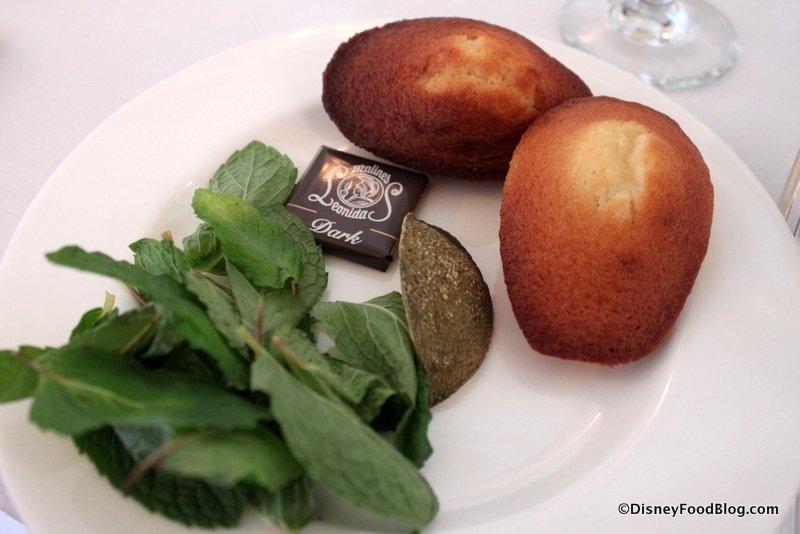 Before me there were several things in the setting: a placemat with pours of four different versions of Grand Marnier; the aforementioned Mimosa; and a plate with a square of French Chocolate, two Madeleines (shell-shaped small cakes), a dried Citrus rind, and Mint Leaves. Are you intrigued? I was! I joined the event just a bit late, but as I arrived, a representative from Grand Marnier had been discussing the history of the company and a little bit about how Grand Marnier is made. 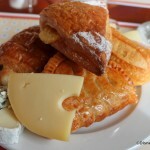 It’s an interesting presentation, especially if Grand Marnier numbers among your favorite indulgences. Of course, the interesting thing about Grand Marnier is that it’s much more than just an orange liqueur. It’s actually created by blending orange essence with Cognac, which grants its distinctive taste. Today, we were tasting a full compliment of Grand Marnier offerings. 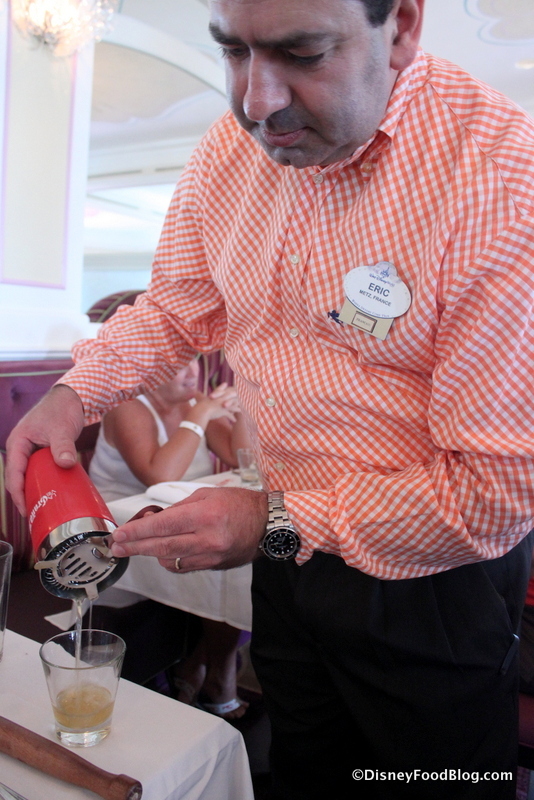 We began with the Cordon Rouge — what we think of when we see Grand Marnier. Next, we tried the Cuvee du Centenaire. Created to commemorate the company’s 100th anniversary, the liqueur appeared a bit darker in the glass, and offered a smoother experience than the Cordon Rouge. It would be excellent for sipping. But we weren’t finished tasting! Next came the Cuvee du Cent Cinquentenaire (SO much fun to say! ), created to celebrate the 150th anniversary of the House of Grand Marnier. Created specifically for Cognac enthusiasts, this version is made with fine aged Cognac and is presented in a beautiful hand-finished bottle. 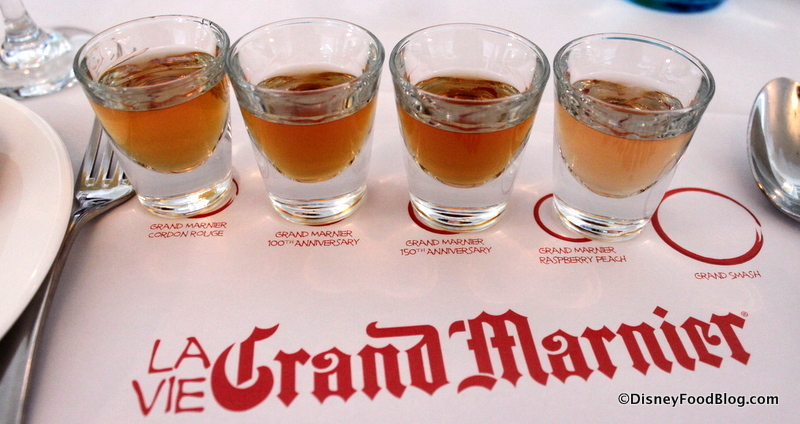 Grand Marnier also offers a Signature Collection that blends natural fruit essence with their original liqueur. 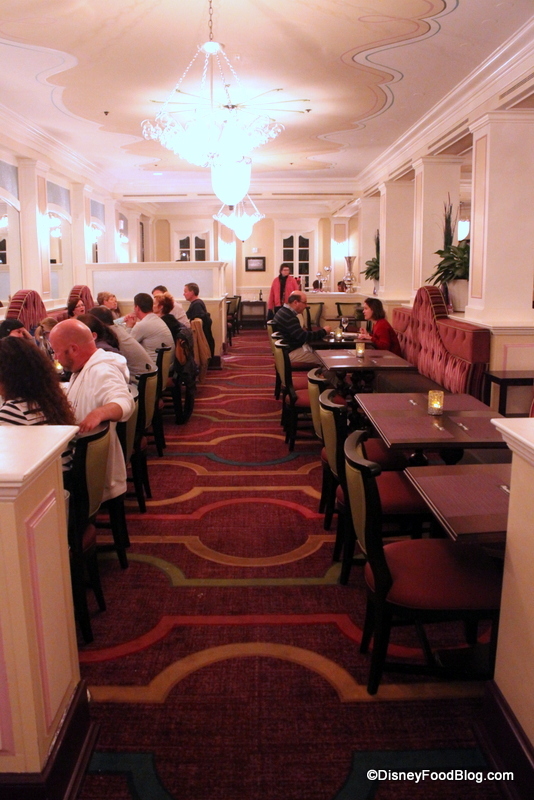 During our event, we were also given the opportunity to try one of them — the new Grand Marnier Raspberry Peach. Yummo! The plate that I mentioned before had a variety of things on it, some for tasting with our liqueur (chocolate, madeleines). But the other items were for building a cocktail, the Grand Marnier Smash. Since I arrived a bit late to the event, a France Pavilion manager helped me to create the cocktail. He placed ingredients into the shaker and muddled them just a bit, smashing them to release the essential oils. After that, he added Grand Marnier and ice, and shook the cocktail vigorously to mix the ingredients well. He then strained the mixture back into a glass over fresh ice. Voila! A Grand Marnier Smash! I took the advice of some guests seated next to me and added that delicious Raspberry Peach Grand Marnier to the Smash. It was simple, refreshing, and delicious. 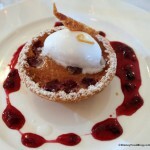 Next, we had an opportunity to sample a few desserts made with Grand Marnier. This was a fun addition — not only were we tasting the liqueur as a drink and within a cocktail, but now we were given the chance to see it showcased as a cooking ingredient. 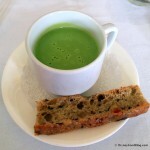 While the desserts were presented together, let’s talk of them individually. The Monsieur Paul waitstaff flambéed the Crêpes Suzette with the addition of Grand Marnier. The crêpes were then folded and topped with the syrup. 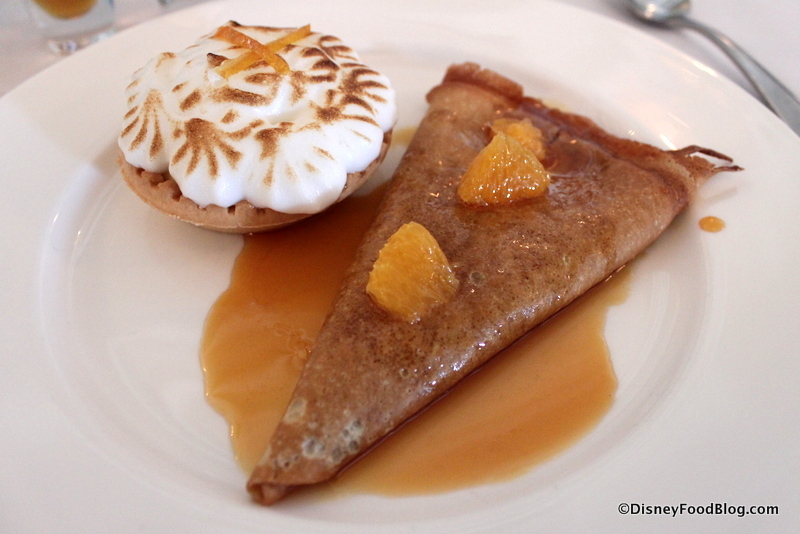 But we also had a lovely orange Custard Tart topped with Meringue. 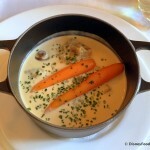 The rich filling was where we found the Grand Marnier in this dish. 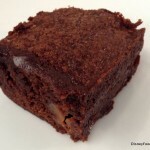 While tasting such a quantity of Grand Marnier and then topping it with dessert was a bit of a sweets overload, it was still a charming — and delicious — way to spend a Saturday afternoon. You think you know Grand Marnier. Sure, it pops up on menus as a mixed drink ingredient, and it’s delightful as a flavoring in desserts. But learning its history and the complexity of the various cuvees will give you an entirely new appreciation for this liqueur. 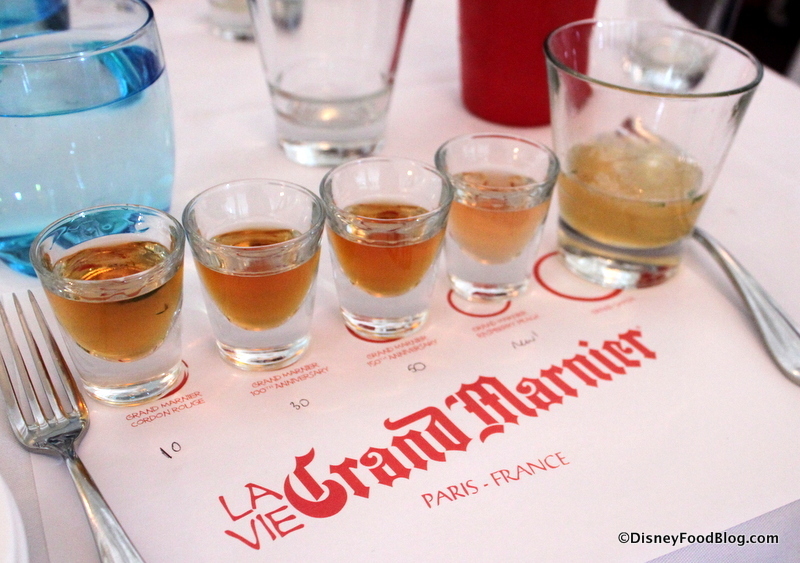 I really enjoyed the opportunity to try different versions side by side, and then to see various ways that you could use Grand Marnier in cocktails and dishes. And the opportunity to taste the more expensive Centenaire and Cent Cinquentenaire makes this an excellent experience for the lover of fine liqueurs, or the novice who’s just learning to tell the difference. Tickets can be purchased for $65 per person by calling 407-WDW-FEST. 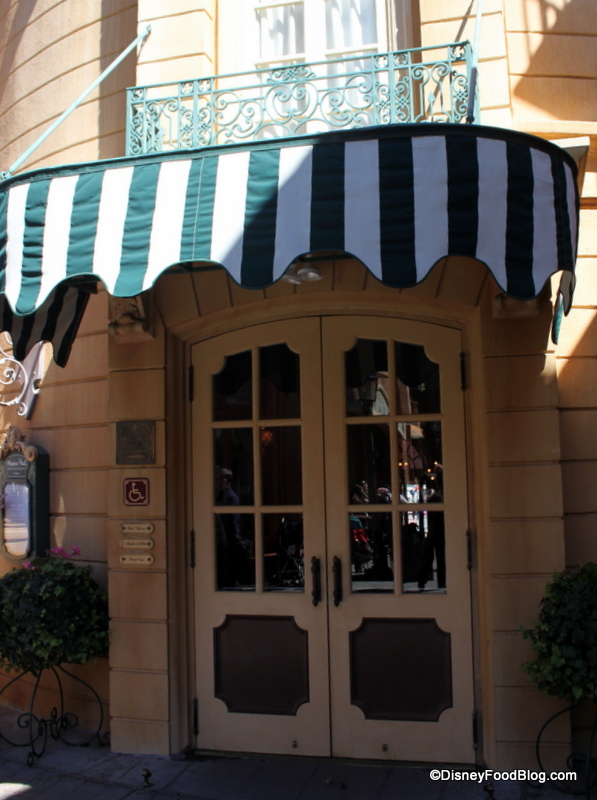 Beyond that, whiling away the afternoon in the sun-kissed dining room of Monsieur Paul makes this a fantastic event for guests who love to experience the full roster of events at the Food and Wine Festival. Will you be attending one of the remaining Taste, Shake, and Indulge Like the French Grand Marnier Tastings? Leave a comment and let us know what you look forward to the most! Thank you to Epcot’s France Pavilion for the invitation to this event. I was not in any way required to attend or to review the event. You can read more about our disclosure policy here. At first glance $65 seems a bit steep but for the amount of premium Grand Marnier they pour – it’s a pretty good deal. As long as they don’t rush you, this would be a heavenly afternoon for me. I was just thinking the same thing. I wouldn’t be able to get up after all that liquor lol. But it looks like a great experience. AJ, this is a little off topic, but can you find out the brand name of the Sparkling Moscato wine they are serving at the little cafe in the Land Pavillion? We really enjoyed it last week, and neither of us thought to get the name. 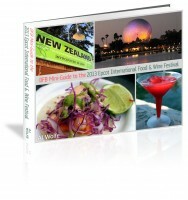 I have searched all over and all I can find are the food booth menus, nothing from that little place in the Festival Center. Goodness I’ve never seen such dark madeleines. Did they taste ok? This looks like quite a fun event! THANK YOU so much for posting that seats for this special event were still available. I thought almost everything had sold out back in August. I called at 10:50pm last night and was able to snag a seat. I’ve been looking forward to a Grand Marnier tasting (of course, the last time I got in, it was FREE) Ah the memories. You made my day!